I've always had a hard time with jackets, as most of them aren't quite cut right for my body type, and honestly traditional blazers usually aren't that comfortable! 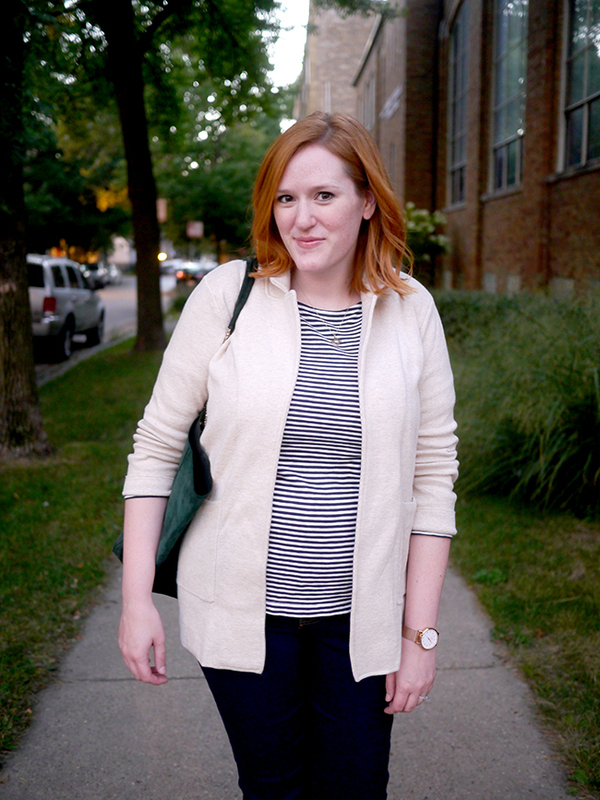 Enter the sweater blazer. I grabbed it on a whim when making some returns, and I am so happy I did! 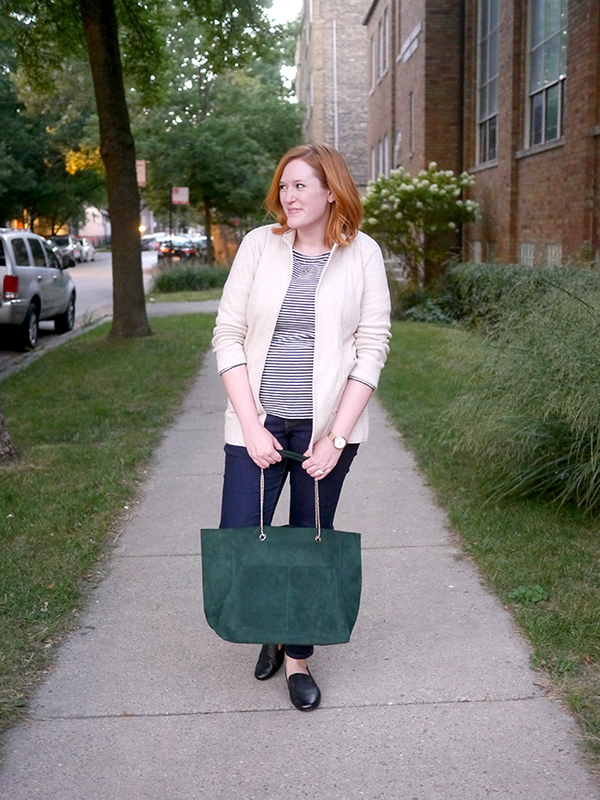 It adds the polish of a blazer, but the fit and comfort of a cardigan. Just a note that this one does have a full collar but no matter how much I try to press it down, it always ends up popping up a little like in these photos. This version is a little more expensive but looks like it wouldn't have the same problem, and this one with buttons is a cute option too. Striped tee shirts are definitely the heroes of my wardrobe. They're just a little more detailed and fun than a plain tee, and seemingly go with everything - skirts, jackets, sweaters, vests, you name it! I love this one for the flattering fit and the slight boatneck that doesn't actually show my bra straps. Plus the sleeves are actually long enough for me! Definitely size up though, they tend to shrink a little in the wash. 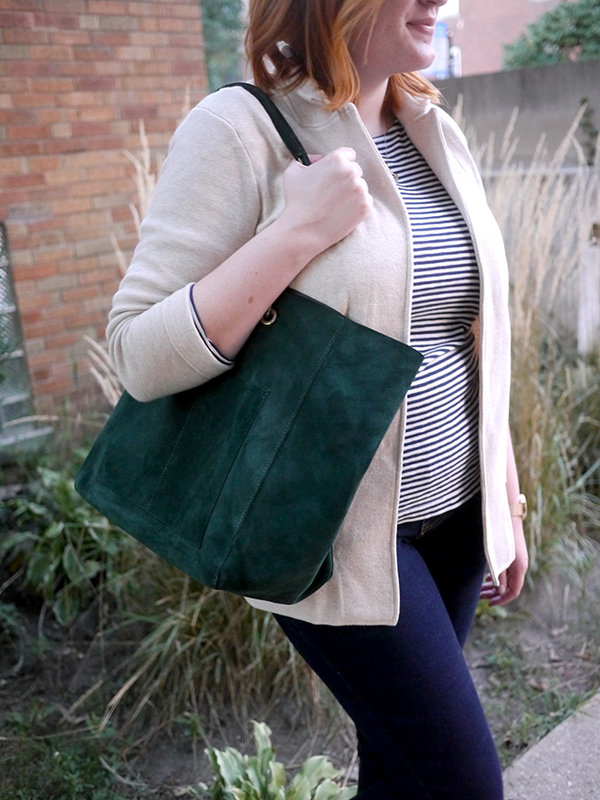 Pro tip: Pull just a hint of your tee sleeve out of the bottom of the cardigan sleeves - it makes it look like you put a little more thought into your outfit and adds some fun detail. If jeans are appropriate for your workplace, look for a pair that are dark wash with no holes or distressing. Skinny jeans are great, or boot cut/straight cut if you prefer those. Just avoid jeggings that really obviously look like jeggings - I'm talking skin-tight, slightly shiny, or missing pockets. If you can't get away with jeans at work, you can easily replace these with a pair of skinny dress pants. 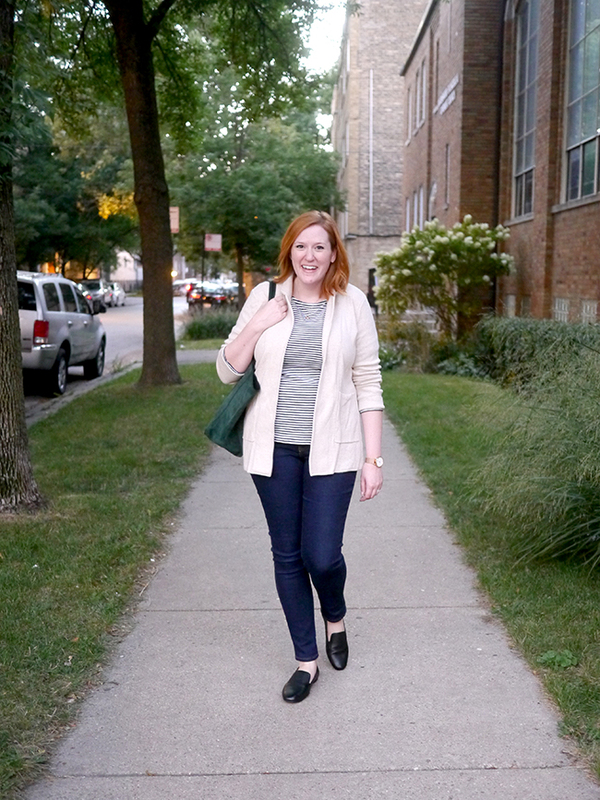 Comfy flats are a must for me at work - my feet are really sensitive and I typically can't get away with heels for more than a few hours, especially commuting to downtown Chicago! These have a cushy insole and are soft, comfortable leather. 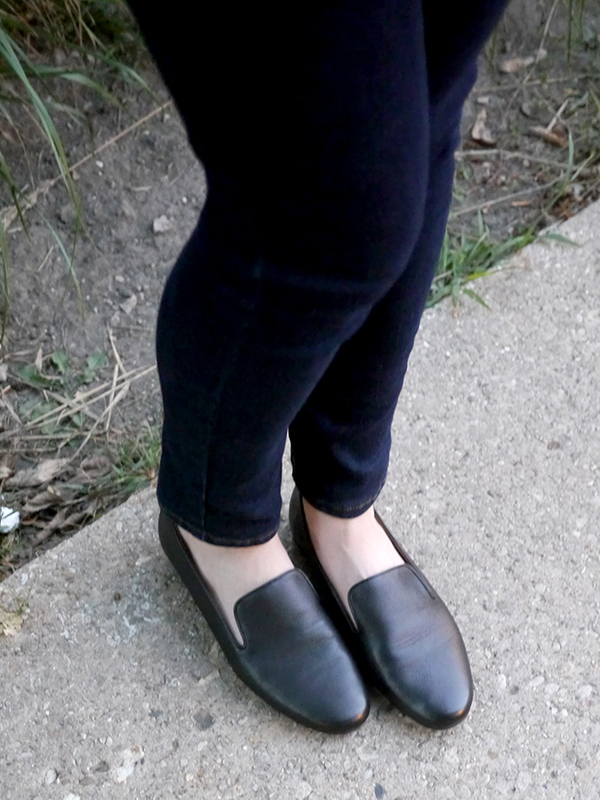 Plus the loafer style is polished but still fun for fall! 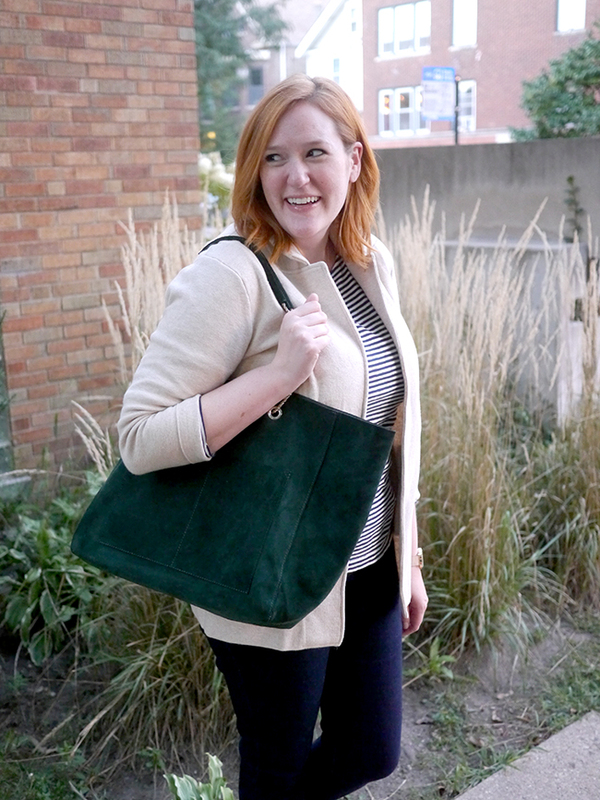 Add in a few accessories like a polished work tote and simple jewelry, and you're good to go! In other news, it looks like fall is finally here! Jeff and I were dawdling before heading out to take these photos, and looked up at 7pm and realized it was already dusk!! If you look in the background of these photos you can see the yellow from the street lamps. 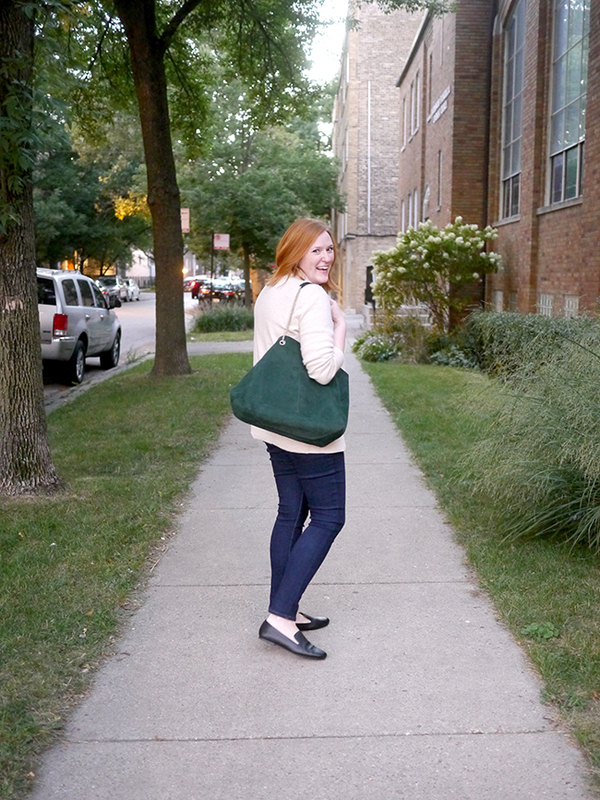 Looking forward to fall weather over here, but definitely not to it getting dark so early!